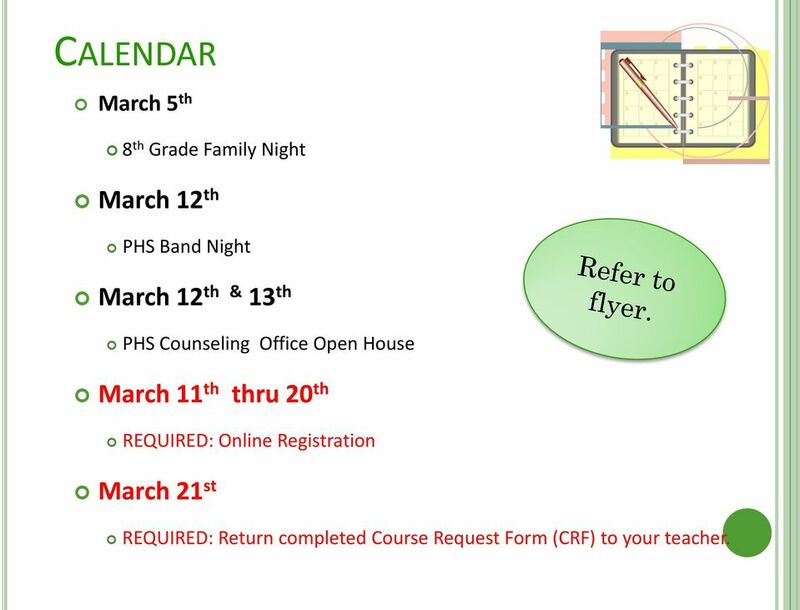 Download "WELCOME TO PHS CLASS OF 2017"
2 CALENDAR March 5 th 8 th Grade Family Night March 12 th PHS Band Night March 12 th & 13 th PHS Counseling Office Open House March 11 th thru 20 th REQUIRED: Online Registration March 21 st REQUIRED: Return completed Course Request Form (CRF) to your teacher. 12 Talk to your teacher about which class they recommend. 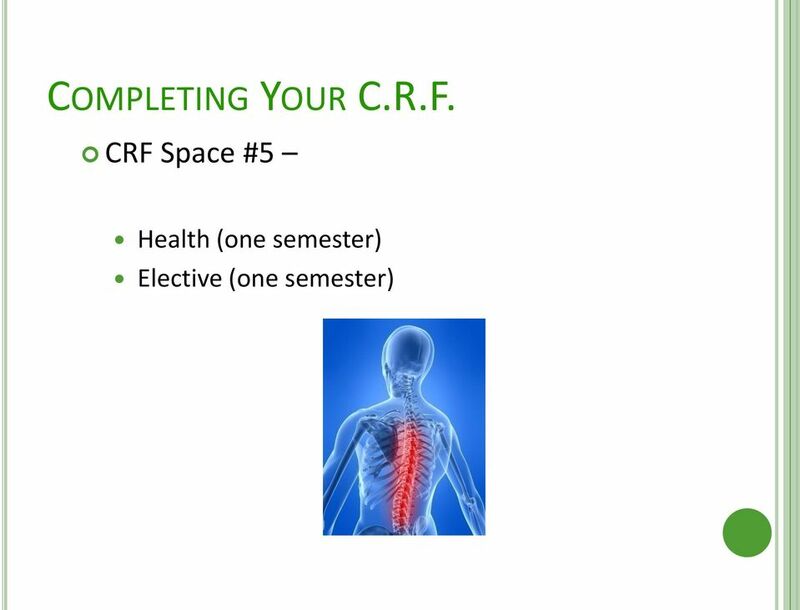 14 COMPLETING YOUR C.R.F. 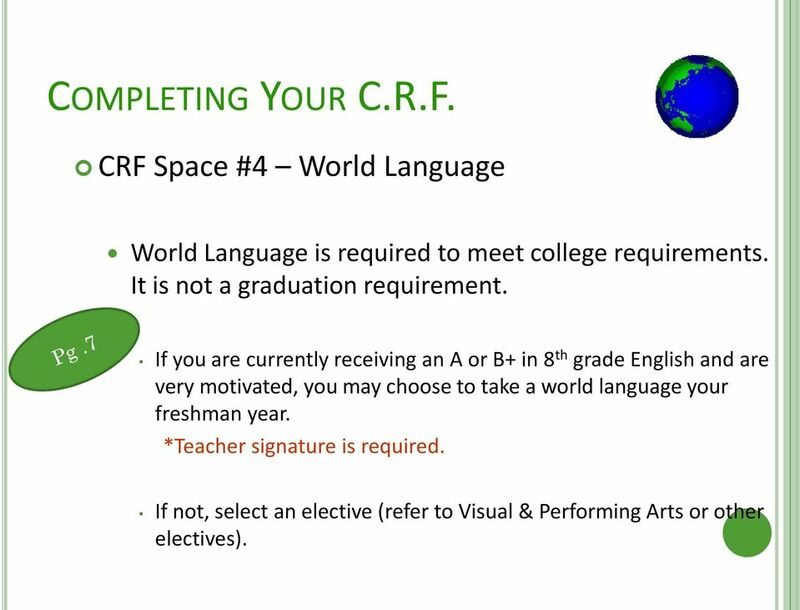 CRF Space #4 World Language World Language is required to meet college requirements. 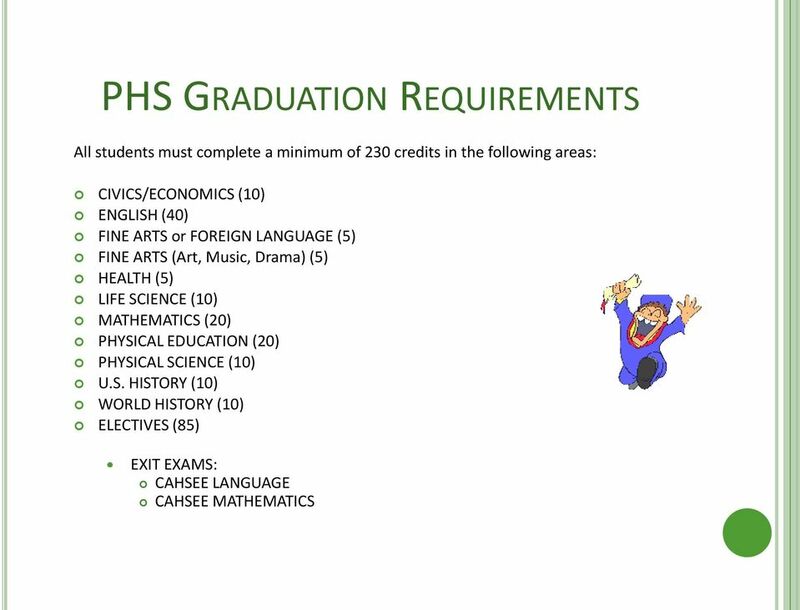 It is not a graduation requirement. 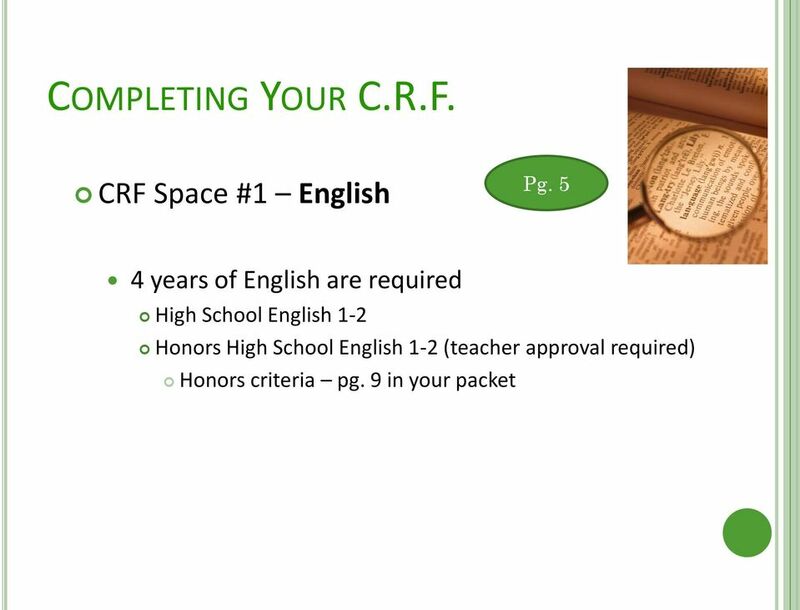 If you are currently receiving an A or B+ in 8 th grade English and are very motivated, you may choose to take a world language your freshman year. *Teacher signature is required. If not, select an elective (refer to Visual & Performing Arts or other electives). 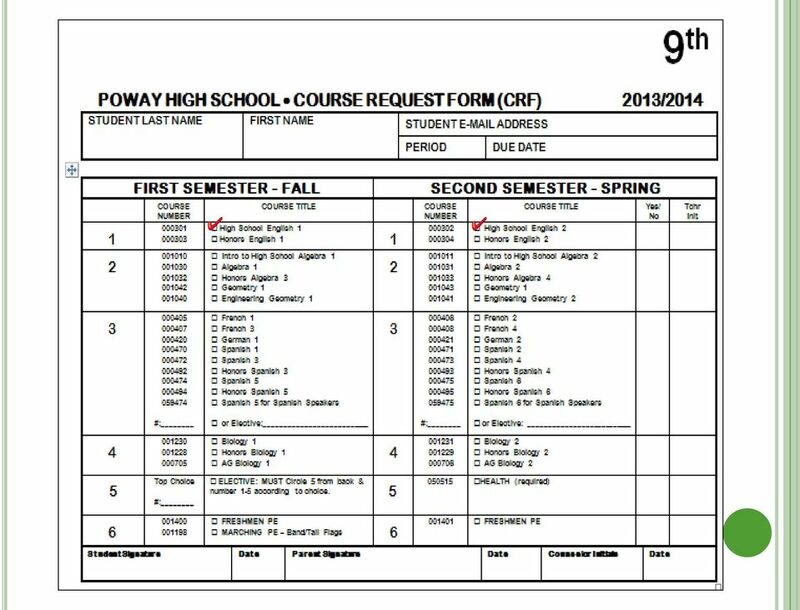 15 WHAT ARE ELECTIVE CLASSES? 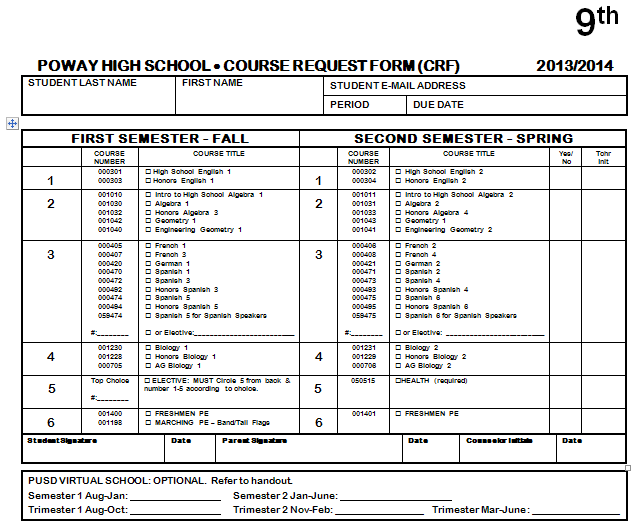 Classes from any department but usually include a fine art. 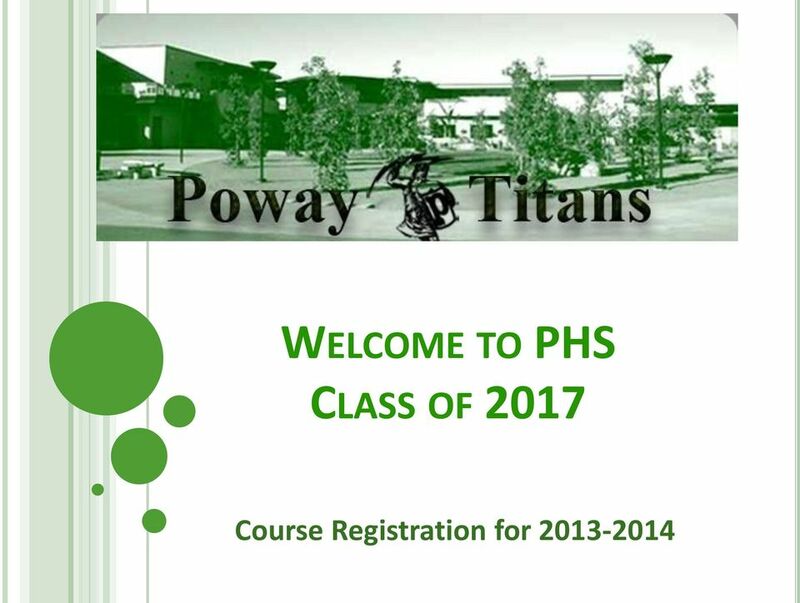 Fine Arts Drama, Drawing/Painting, Ceramics, 3-D Computer Animation, Band, etc. 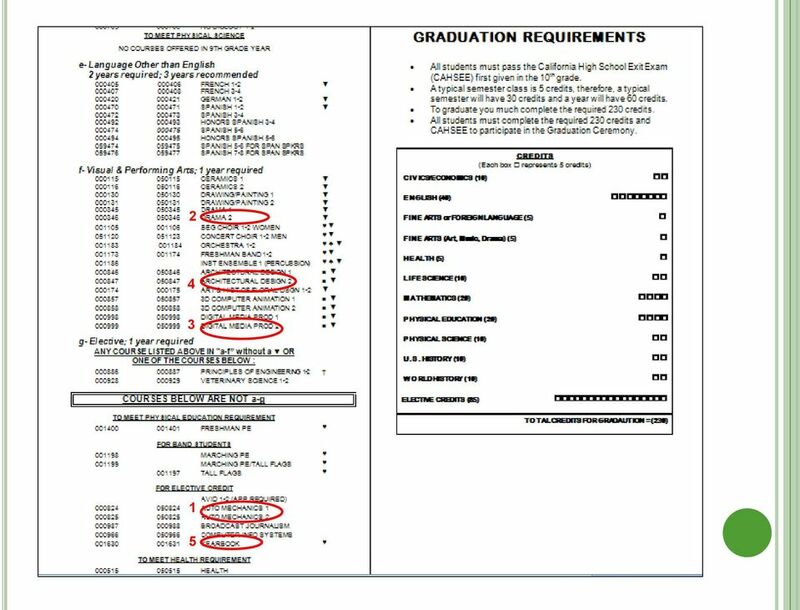 Other Electives Auto Mechanics, Yearbook, etc. 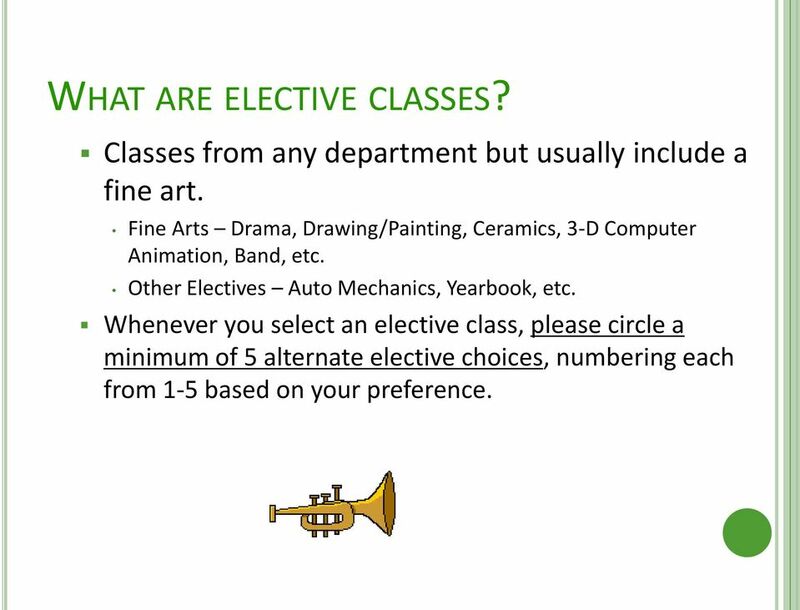 Whenever you select an elective class, please circle a minimum of 5 alternate elective choices, numbering each from 1-5 based on your preference. 21 REMINDERS Read all Instructions! 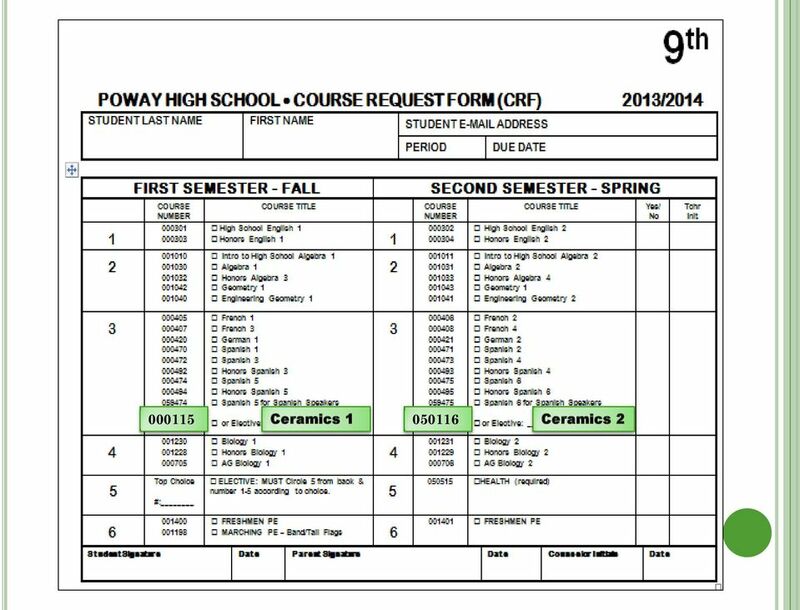 You are requesting your classes for the entire school year. 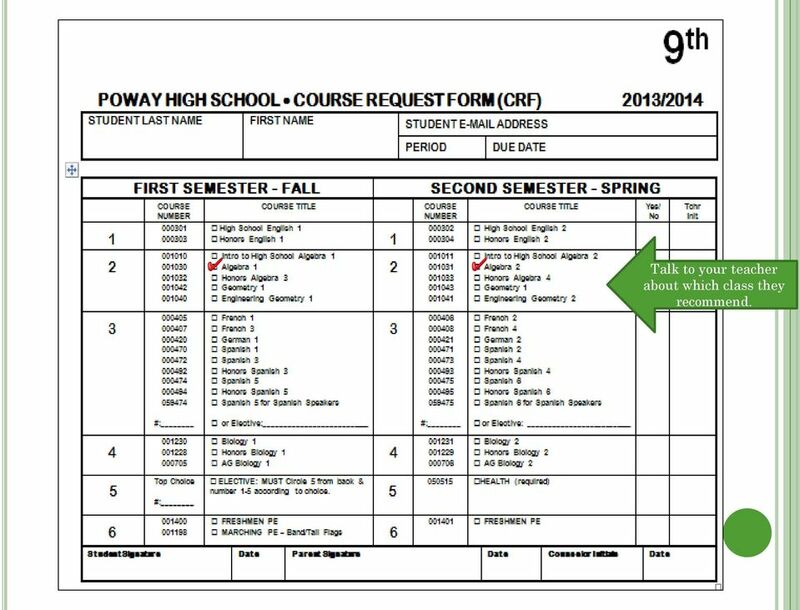 Master schedule is built and teachers are hired based on requests. Choose classes wisely. 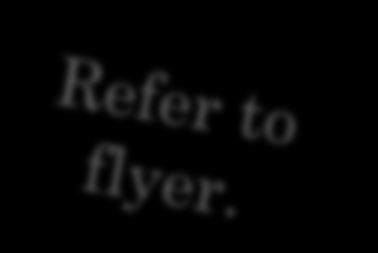 Include up to 5 alternates for Fine Art, and other electives. 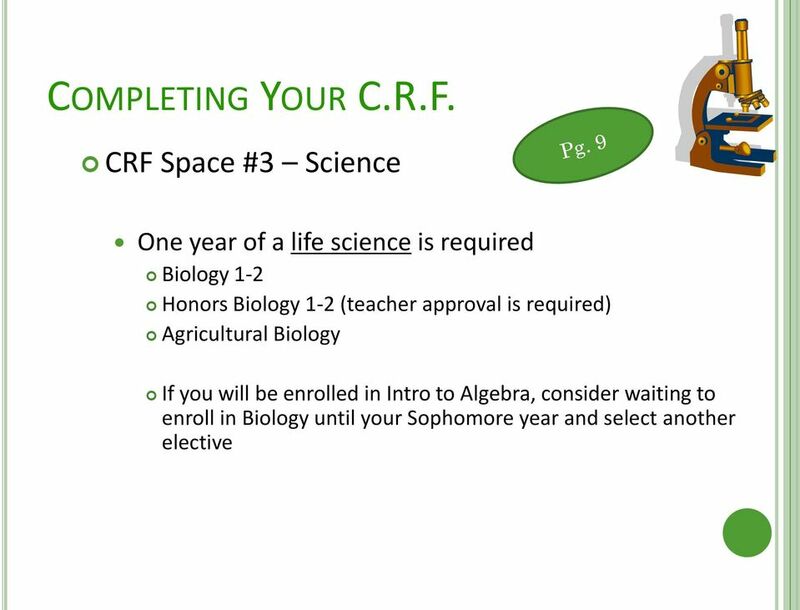 Ability to change classes at the start of the school year will most likely NOT be an option. 22 ONLINE REGISTRATION NOVELL login just like one used on campus. 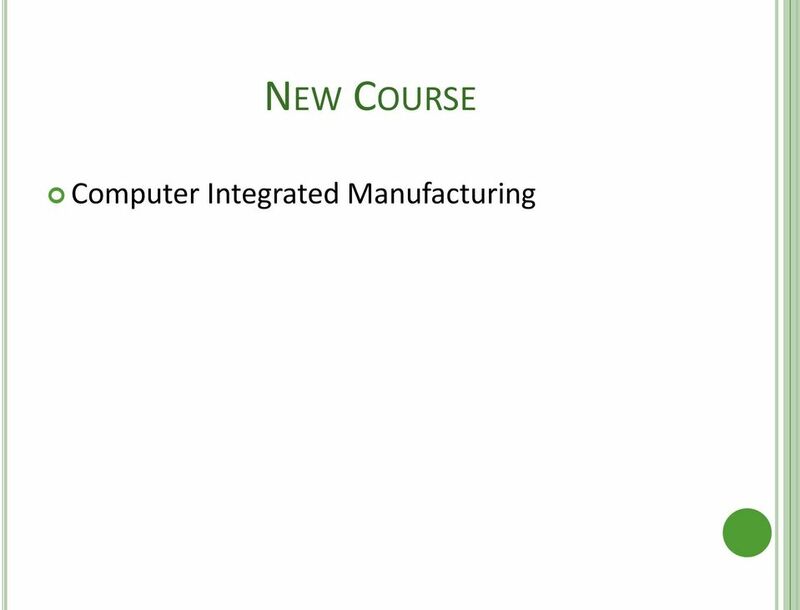 Input course requests using course numbers! DO NOT search using course title or department. Double-check course selections before locking. Cannot make changes once locked. 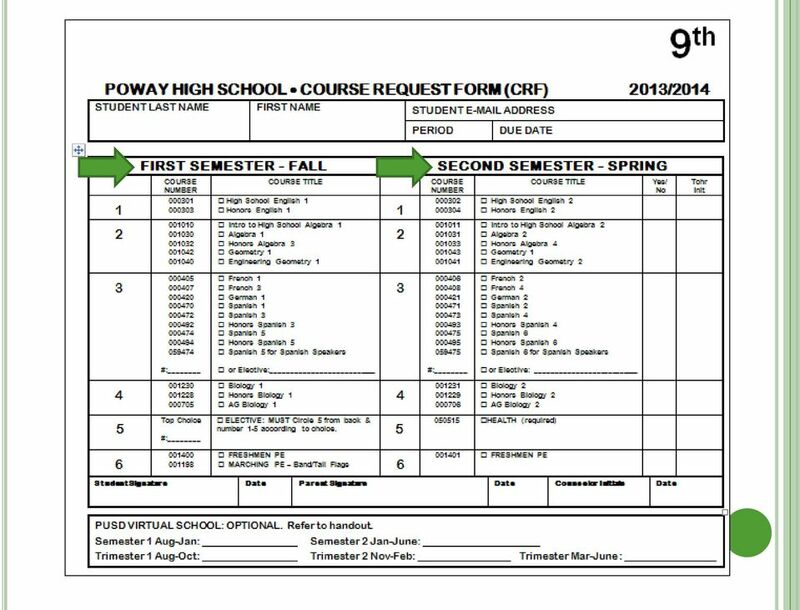 23 POWAY UNIFIED SCHOOL DISTRICT ONLINE COURSES & VIRTUAL SCHOOL Limited Availability Classes subject to change NCAA approved TRIMESTER TRIMESTER TRIMESTER Aug-Nov Nov-February March-June Virtual Classes Offered Health AP Studio Art *1 Studio Art*3 US History 1 Chemistry* 1 Semester August January Algebra 3 Algebra 4 Automotive Tech * AP Studio Art* 2 Studio Art *4 US History 2 Chemistry *2 Health Semester January-June *Requires lab attendance once a week. 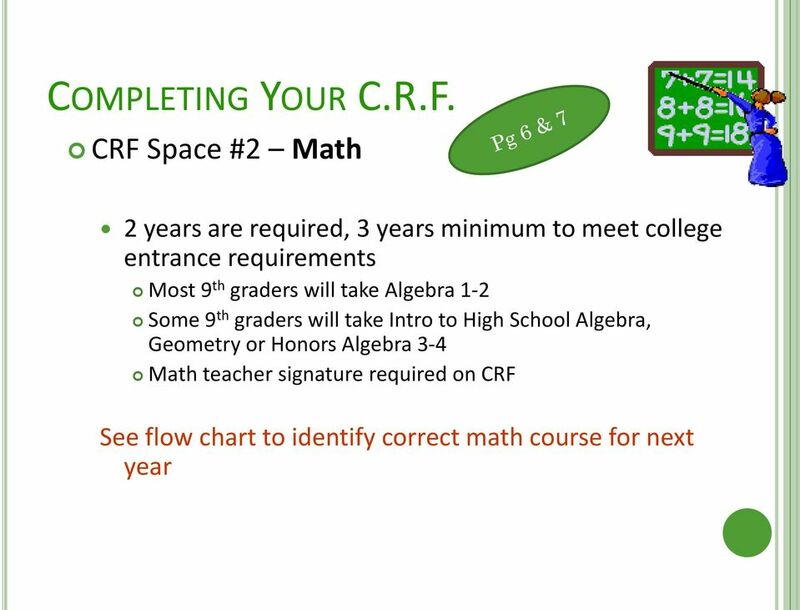 Please note: Algebra 3-4: Priority will be given to next year s 8 th graders. 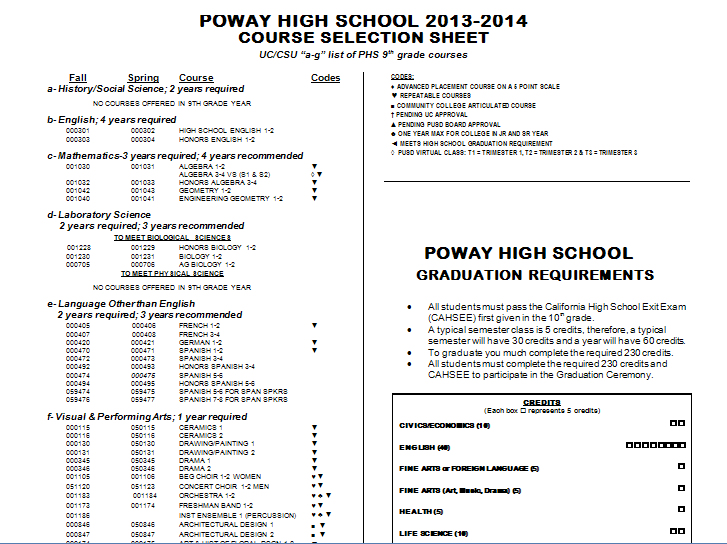 24 Visit PHS counseling website to review course descriptions, graduation requirements, sample 4 year plans, etc. QUESTIONS? 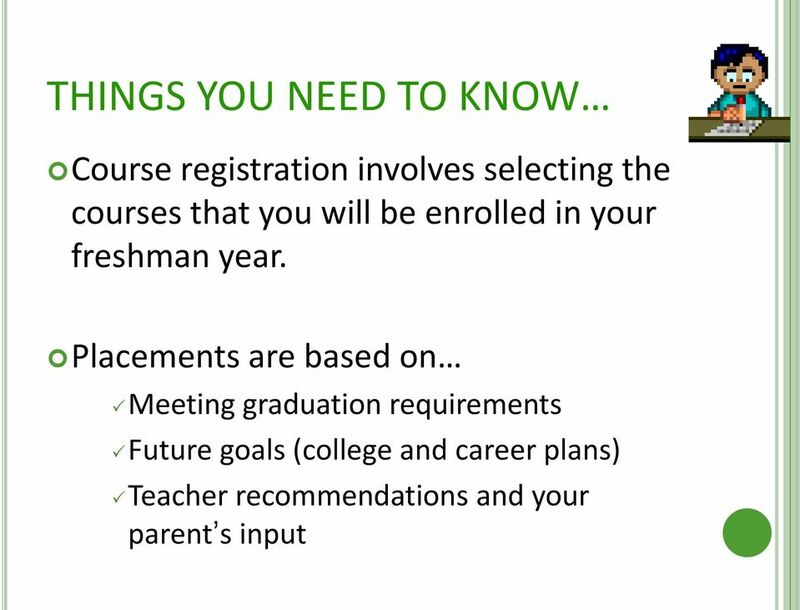 Talk to your teachers and parents about the classes that interest you. 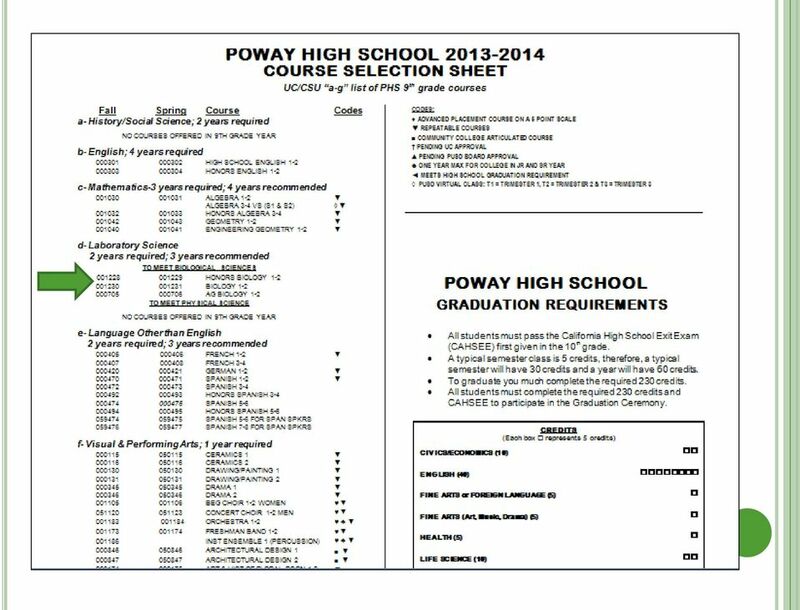 PHS Counseling Office Open House March 12 th - 7:30-9:00 a.m. March 13 th - 4:30-6:30 p.m. 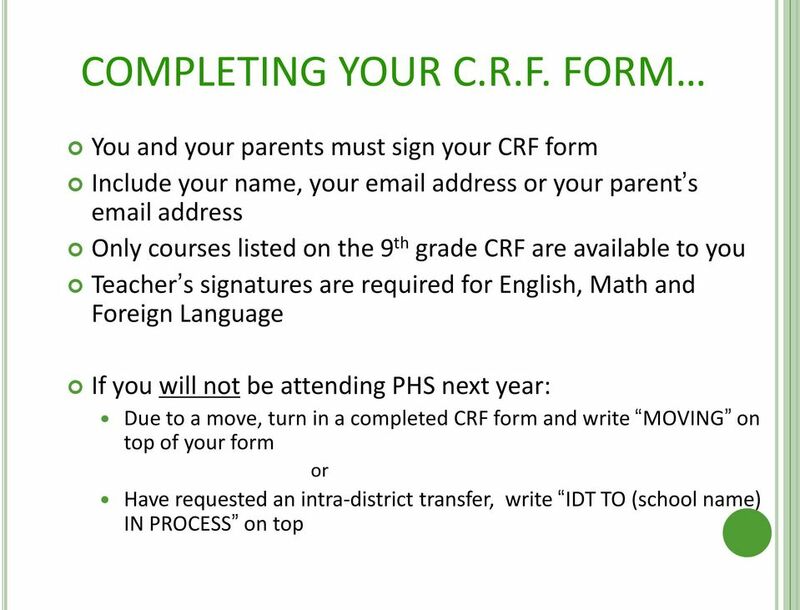 Remind parents about 8 th Grade Family Night on March 5 st at PHS. 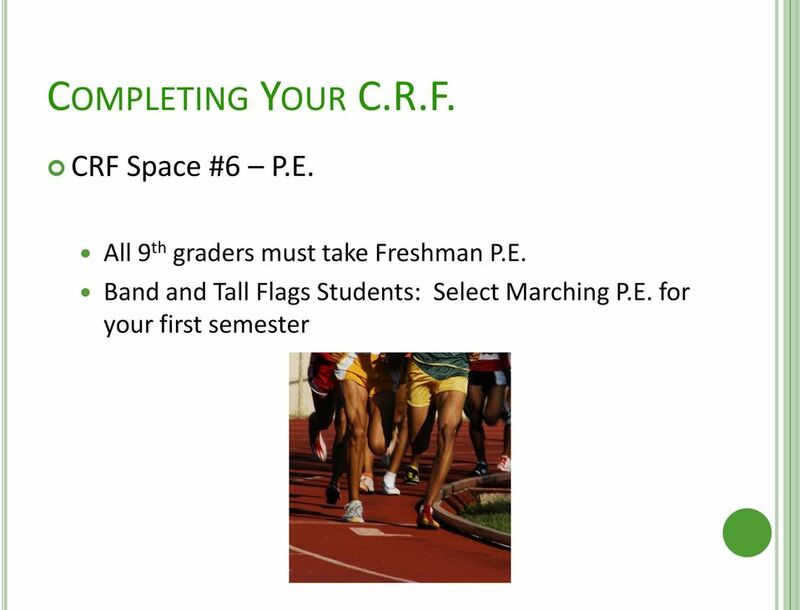 Refer to your registration packet. Welcome Del Norte Nighthawks Class of 2019! Newbury Park High School Counseling Department Presents. Your Four Year Path & Beyond! San Mateo High School Sophomore Information Night Class of 2011 Welcome Introduction Don Scatena Assistant Principal (Instructional services) Counselors April Torres A-G Georgiana Watson H-N Andrea M.
VHS Dual Enrollment Procedures and Guidelines Steps you need to take in order to become a dual enrollment student: 1. 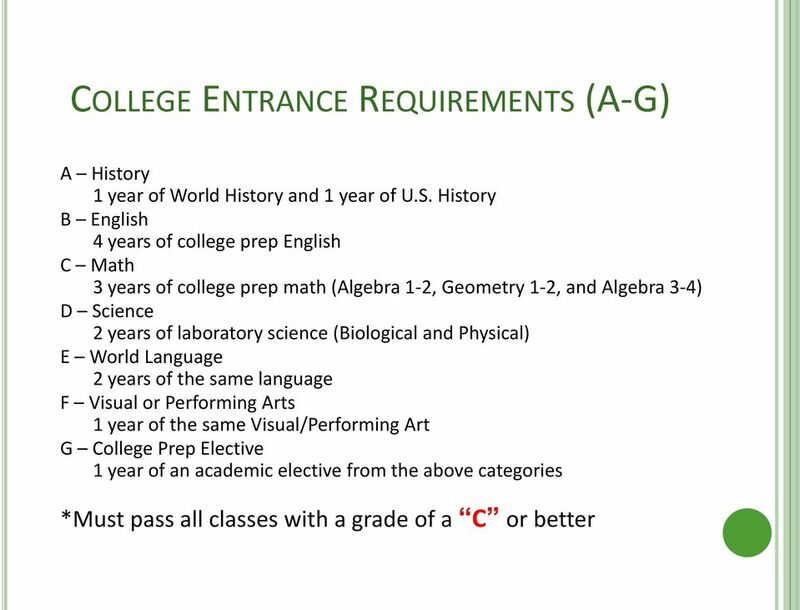 You need to meet with your counselor to discuss all of the aspects of dual enrollment. Welcome to Eden Prairie High School" Class of 2019 Parents" February 2, 2015"